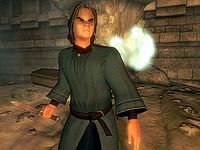 Kalthar, a Nord battlemage, is a disgruntled Journeyman of the Mages Guild who resides at the Leyawiin Guild Hall. He's not happy about the current head of the Leyawiin Guild Hall, Dagail, however. As you'll learn in the Leyawiin Recommendation quest, he's so unhappy, that he'll stop at nothing to see her disposed of for the sake of his own advancement. He lives a very simple life, and prefers to keep to himself. He sleeps alone in the guild building's basement from 2am until 10am. After waking up, he will enter the ground floor and either wander around or sit down on one of the benches to read the common text A Less Rude Song. After eating lunch in the dining room from midday to 2pm, he will again be found either wandering or reading until his bedtime. Every two hours he will get bored and consider switching activities. The only change to this schedule is during the related quest. Once you have Manduin's Amulet in your possession, he will be relocated to Fort Blueblood Halls and will wander around in the corridor until he detects you, at which point he will enter in conversation with you. After his speech, he suffers a disposition hit and will therefore proceed to attack you. He wears the standard mage's robe and a pair of pigskin shoes. 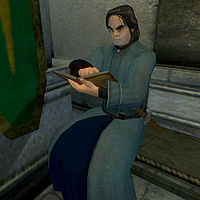 He also carries his book, the common text Galerion The Mystic, his key and a leveled amount of gold. In combat, he relies on an iron dagger and on a leveled set of standard necromancer spells. If you are on business to collect the Leyawiin recommendation he will comment: "Oh, boy. Good luck getting that. Dagail's the only one who can write one. If she can remember who she is today that is." While the other members of the chapter are unhappy with their leader Dagail, Kalthar is downright angry and will also come up with a bit of interesting information on her father in his rage: "Why should we be forced to work under someone, who's only kept sane by a magical trinket? Haven't we sacrificed enough already? She shouldn't even be here anymore. Hell, the only reason her father ever fit in anywhere is because he kept a low profile. And look what it got him! Years of service to the empire and not even a tombstone over his head! Hrmph. At least he was able to maintain the illusion of sanity. I know, I get way too fired up over this. It just annoys me that she's in charge of the guild, when she's clearly not fit. That's all." If you pursue this topic he will retort: "What? haven't I said enough already? Just let it go. Once someone finally realizes what's going on here, maybe things will change." If you ask about her directly, he adds "I heard she was put in charge of the Leyawiin guild hall as a favor, not because she deserved it. That doesn't seem right, does it?" and pours on even more vitriol if you ask him about Agata: "She's the one you want to talk to if you actually need something to get done around here. I don't even know why Dagail is still around." When you meet him in Fort Blueblood, he will appear to be somewhat scared: "Look, j-just stop right there, all right? I can't let you leave with that amulet. I need it, right now." When you ask him what he is doing in the fort, he will finally reveal his real intentions: "What, you think I didn't know what you're up to? I knew you were looking for it. I knew you'd find it, and I had to stop you. Now hand it over." And he will elaborate if you ask him why he stole the amulet: "I took the other one, and that should've been enough. I shouldn't have to go through all this, just to get rid of her! It's not even as if I was going to keep it forever. I was going to give it back to her, once I'd gotten what I wanted. That's not so wrong, is it? Once she helped me advance out of that place, and stepped down, then she could have it back! Why did you have to get in the way? Why are you trying to ruin everything?" At one time he was apparently a Necromancer, but he claims to have reformed and now abides by the rules of the Guild: "The guild lost a good number of members when Traven banned the practice of Necromancy, but some of us stayed behind." However, after his evil scheme has been exposed, the other guild members will say: "Kalthar tried to ruin the Leyawiin guild. Just goes to show, you can't trust a Necromancer, even if he claims to be reformed." The other members will also be happy that things are back to normal in the Leyawiin guildhall: "I understand that Dagail is in much better control of her faculties now that Kalthar's plot has been exposed." Just before Kalthar attacks you - as he delivers the line "Why are you trying to ruin everything? ", he is removed from the Mages Guild faction so you can fight him without any guild consequences.